“Flat-Out Reliability” — It is so important to us, we put it right in our logo. Flat-out, full speed, we mean it. Our tools are meant for the high-production industrial user and are designed to withstand the abuse of high feed rates and long production runs. Reliable, dependable, believe it. We work with the most respected manufacturers in the industry. Our tools are proven reliable with years of testing and experience behind them, long before they ever get to your factory. 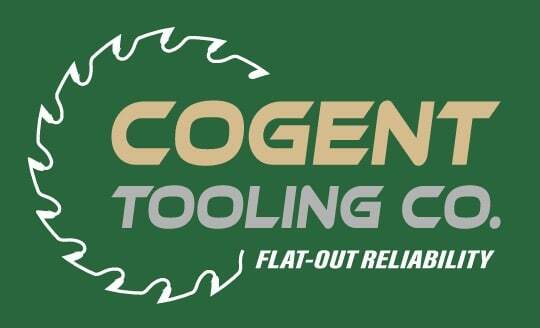 Cogent Tooling was founded in 2005 by long-time tooling expert, Jerry Brownell. Brownell served as applications engineer, tool designer, and key accounts manager for two of the world’s largest tooling companies. We have years of experience in supplying the correct tooling for the application and pride ourselves in keeping up-to-date on the latest machinery and technology, as well as understanding the nuances, capabilities, and limitations of existing equipment. Our supplier base consists of the world’s most respected tooling manufacturers from the United States and Europe. We remain steadfast against importing ANYTHING from China, Taiwan, etc., just to be able to cut cost. Despite this, we remain cost competitive by dealing direct with the manufacturers of quality tooling, rather than buying them through convenient channels like many of our competitors. We specialize in top-quality high-production tooling for industrial applications. We also offer premium tooling for custom woodworking shops and high-end hobbyists. Our goal is to make you successful. Serve the customer. Do everything in your power to meet their every need. Supply only the best quality products. Strive to be the leader in product knowledge, machinery, and applications. Be the customer’s tooling expert, the one they can always rely on. No customer is ever too big or too small. Bring unique solutions to the customer.